Wow! Where did this week go? 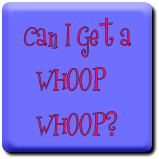 Time has just flown by, and we're here again at Friday - and that means it's time for us to get our whoop whoop on! Are you ready? Let's get started! I've been sewing a lot this week, but not on anything very exciting - I've put binding on a bunch of quilts, and worked on repairing a t-shirt quilt top so that it can be quilted. About the only thing I'm really excited about, I've already posted about this week - - - but I'm gonna share it again because it feels so good! ...while these two containers hold the scraps that I cut up on Sunday before the Super Bowl! It's amazing what you can do when you get on a roll! Sounds like you checked off a lot of finishes this week. Congratulations! Do you want to come to my house and cut scraps? It's the thing I always put off and the number of boxes waiting is multiplying. I am so impressed. You get my wink and nod for sticking with the program! Fabric scraps are the equivalent of food leftovers. Sometimes they are simple hard to stay on top of. Go, Sarah! Yay you for keeping up with the scraps!! Although I have a lot of older scraps, because of your incentive, all my new ones are processed...a bucket for a sewing group, a bucket to stuff dog beds for shelter, and the rest are filed away by size or color. Sorry! I had some errors when trying to enter link and now I see it is there x4. I'm not sure why but I don't see a way to delete. And congrats on staying on top of your scraps! That's not an easy job. Would you share with us, where you got your storage box? I am really envious. It looks so perfect for cut pieces. Kudos to you for staying on top of your scraps? Do you use a Go cutter or (gasp!) hand trim the pieces down to various sizes? Also, what's the plan for the left over t shirt fabrics? I was planning on returning the excess pieces to the customer. I do know they make great rags! Oh my! I really agree about how fast this week has gone by. Scrap management is something I am always trying to attain!! LOL. Congratulations on your progress! Sorry, I entered my link twice. Please forgive me! I love the way you are organizing your cut pieces. It is so cute! If you are putting bindings on quilts that must mean you are very close to finished. You certainly deserve a whoop whoop! I love that storage box also. Looks roomy and colorful. Where did you get it? I have so enjoyed reading about your scraps journey! They look so tidy and usable! The container you chose to organize those squares is perfect!